What the heck, Old Man Winter? After one of the mildest winters in recent memory, the snow finally arrived this week in upstate New York. We had somewhere around 6″ of snow on Monday, and that makes April the snowiest month on record this winter. Yup, April. We have daffodils starting to pop up in the yard. And now they’re covered in snow. I happened to be out grocery shopping on Monday morning when the worst of the snow came through our area. And I was totally not dressed for the occasion. I did have my big winter jacket, but I only had sneakers on. Sneakers that soon became drenched and then encased in ice after I slogged across a couple of parking lots. On this week’s shopping list: infant sunscreen lotion. As I was making my way across the store to hunt for the lotion, I noticed a rack of ice salt on clearance. Clearly the store didn’t anticipate the random April snow, so they had put their stock of ice salt on clearance. Needless to say, I grabbed a container for our driveway. It’s not often that you buy sunscreen lotion and ice salt on the same shopping trip. Also on this week’s shopping list: sausage. Sausage biscuits (with a little bit of butter) have long been one of my favorite comfort foods. Every time I go to Nashville to visit my Mom, I can count on sausage biscuits showing up at least once. Simple and delicious! But this time, the sausage was destined for an actual recipe. The sausage was destined for this Sausage and Green Apple Quiche. 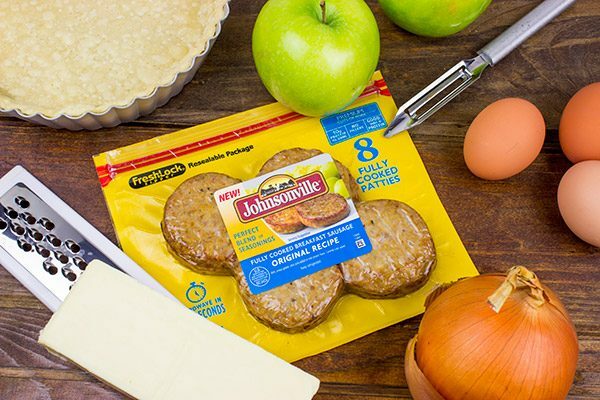 I grabbed a pack of Johnsonville’s Fully Cooked Breakfast Sausage. Ok, in truth, I grabbed two. (I still wanted a round of my sausage biscuits, after all!) Do you guys ever do breakfast for dinner? Every once in a while, Laura lets me go all-out breakfast style on dinner, and this time I was craving a quiche. I pulled out my basic quiche recipe, but I decided to put a little twist in there. Green apples. The sweet tartness of green apples actually pairs quite well with the sausage. The trick to using green apples in quiche, though, is to shred the apples. Unlike apple pie where I typically slice the apples, I like to shred the apples on a course grater for quiche. (Make sure to peel the apples first, though!) This shredding method makes sure that the apples get fully mixed throughout the quiche. In fact, you could call green apples your secret weapon for this Sausage and Green Apple Quiche. Unless you saw the apples go in, you might not realize they’re in there. 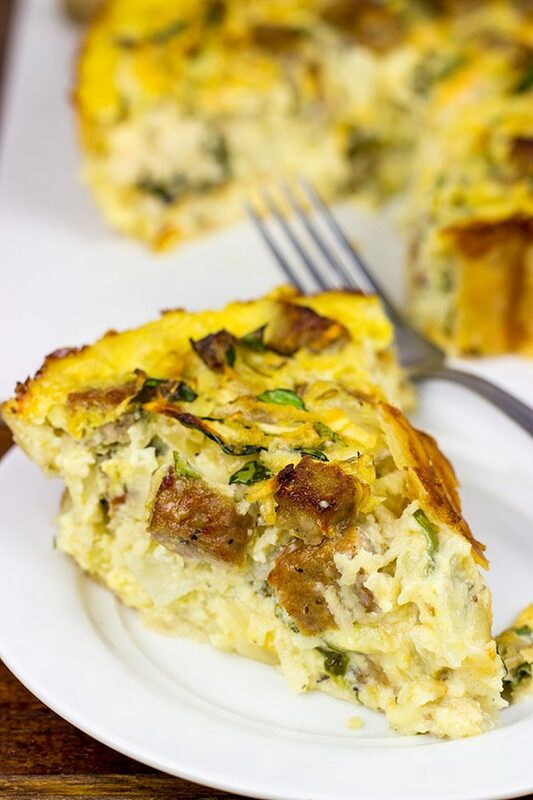 But the result is one delicious quiche that’s perfect for breakfast, brunch or perhaps dinner. 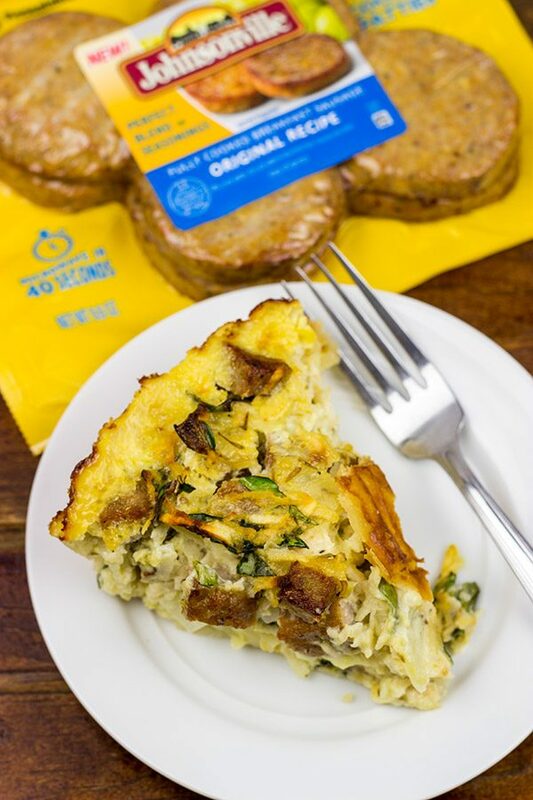 Johnsonville’s Fully Cooked Breakfast Sausage is great for any sort of quiche recipe. Not only does it taste great, but you also don’t have to worry about pre-cooking the sausage. Just chop it up and drop it straight into the quiche. Throw the whole thing into the oven and walk away. Or go do some dishes. Or go shovel snow out of the driveway. Did you get hit by this round of crazy April weather? Roll out the pie dough into an 11” circle. Grease and flour an 8” x 2” tart pan. Carefully press dough into pan, pinching off any excess dough. Using a fork, prick bottom and sides of dough every ~2”. Bake pie crust for 10-12 minutes, or until it just begins to turn golden brown. Slice sausage links into ½” cubes; set sausage aside. Using a large skillet, add olive oil and place over medium-high heat. Once hot, add diced onions and sausage. Cook, stirring occasionally, for 5-6 minutes, or until onions begin to soften. Remove from heat and set aside. Using a large bowl, beat the eggs until well combined. Add all remaining ingredients (sausage, onions, milk, cream, sugar thyme, salt, pepper, both cheeses, spinach and shredded apples); stir until well combined. Let cool for 10 minutes before slicing into wedges. 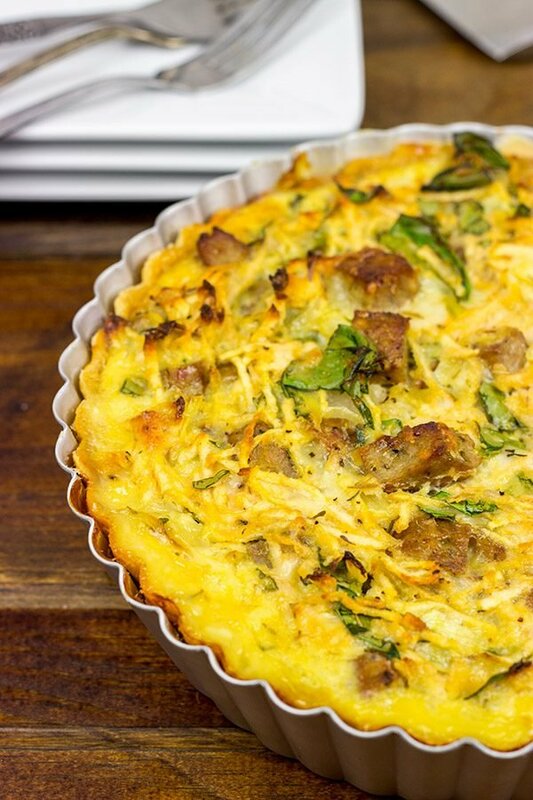 This quiche can be fully cooked a day ahead. 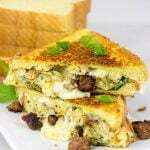 Simply reheat it by placing it in a 200° oven for 20-25 minutes, or until warmed through. 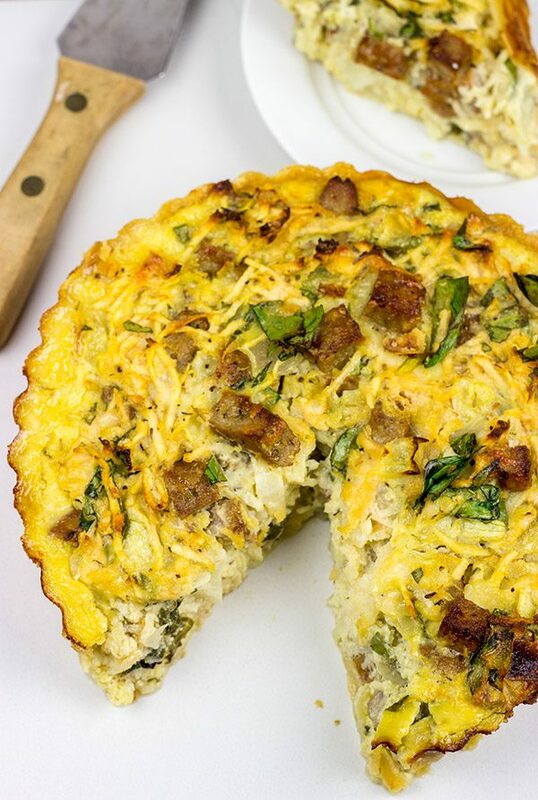 This Sausage and Green Apple Quiche post is written by me on behalf of Johnsonville Sausage. The opinions and recipe are all my own. Thank you for supporting the brands that support Spiced! WOW! snow again! Its beautiful right ? Yeah, I’m hoping we have a really nice summer, Dawn! I did see something on the weather channel saying that summer temps in northern half of country will be significantly hotter. I hope that doesn’t mean too hot! I hope that weather changes quick! Those daffodils need a little sunshine! I totally love breakfast for dinner, but I can only do it when Rod is out of town! He hates it! 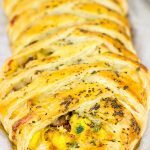 The kids and I totally plan a huge breakfast meal every time he’s gone! This quiche looks amazing. The apple sounds like an interesting addition! I’m going to have to give this a try! Apple in quiche sounds super intriguing! I’m a big fan of apple in other savory dishes (I love it in chicken salads and stuffing), so I’m sure I’ll love this too. That’s pretty funny about buying sunscreen in the middle of a snowstorm – but hey, the weather may change any day, and it’s good to be prepared! We got a bit of snow in southeast Michigan, but it didn’t really stick around. 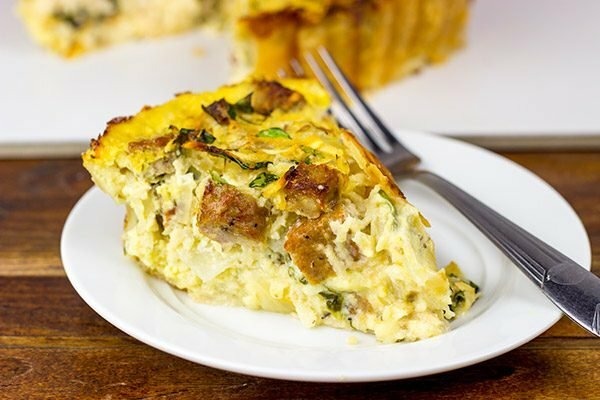 David, what a fantastic idea to add green apple to a quiche with sausage! Just fantastic! Not to mention, so totally YUM! I’ve been hearing about the snow hitting the north – ugh! Unfortunately, I don’t have any snow-woes – we are nice and warm here in ATL – though the mornings are chilly at around 45-ish degrees – but cannot complain as afternoons are in the 60s and 70s! Totally yum, Shashi! I love apples + sausage, so I figured why not throw them into the quiche together. 🙂 You know what’s funny, though? 45 was chilly when we lived in Atlanta (I loved those chilly mornings…esp in the Fall), but now 45 is warm. Hah! That’s quite an interesting combination of flavors David! sound delicious! The recipe title alone had me! This sounds amazing, love the flavor combo in this one Dave. I love shredded, tart apples in salads, too. Nice job on this quiche! Pancetta and gouda? Wow, that sounds like an awesome combo, too, Kevin! Tart apples are a solid addition in quiche…and they go so well with sausage. 🙂 Thanks, my friend! So do you taste apple in the quiche? Or does it just lend tartness? I’ve never had sausage paired with apple, but I wonder why not? It sounds like a good combo. And breakfast for dinner? Yes! To be honest, you don’t really taste the apple at all, Jeff. There is a slight tartness and a slight sweetness, but there’s no way you’d know it was apples if I didn’t tell ya. Give it a shot sometime! I never thought about putting apples in a quiche. Great idea, I think that the sausage and the apple would pair nicely. Looks delicious! Here in Minnesota, it has been cold all week, some parts of Minnesota have had snow, but we have just had rain. I can’t wait for it to warm up. Sausage and apple do pair well together, Dawn. I got the idea because one of my go-to Thanksgiving stuffings involves apples and sausage. So why not in a quiche instead? And tell me about it…I am so ready for warmer days. This is the hardest part of the winter…we’re almost there, but then Old Man Winter keeps showing up randomly. Soon enough though. Soon enough! Dude, you should have seen the downpour when I arrived in Melbourne- the day before, it was amazing and warm and then BOOM. Stupid. Mother nature must have been cranky ha! Now this looks absolutely delicious and love how you added apple for some sweetness- I’ll send some runners over for a slice…or the whole thing. You have snow? That’s just crazy! Tell the weather to go home, as it is clearly drunk. It’s meant to be spring. I love that you had added apple to a quiche, so unique. But then, apple does go really well with sausage. Yum! This recipe actually took me right to Thanksgiving…I use sausage and green apples in my stuffing! 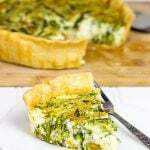 I love a great quiche and this is no exception! Wonderful flavors! Yeah, we definitely started celebrating the warmer weather too soon. That’s why I didn’t even bother with the boots when I went out the other day. Big mistake! Hey, I’m right there with ya on the sausage kick. There’s just so many good varieties out there…and I have to be fair to all of ’em, right? 🙂 Thank you so much for stopping by and commenting, Olivia! Oh boy, this spring. I am wondering should we blame the groundhog for such weather (I missed what did it predict)? But it will be better, David. Besides, this weather allows to have some comfort food like this delish pie, right? And I’ve got a little secret – I’ve never made a quiche (Although I’ve made other kinds of savory pies). P.S.I would have added some sage too here. So I went and looked it up. Phil predicted an early spring. And he was right…until this week when the snow showed up. Snow in April? Seriously? But I like the way you think, Ben. This late snow means we can keep on enjoying some of that cold weather comfort food! Now go make a quiche. And put some sage in there–that would be a great addition! Yes we got about the same and it’s still hanging out. Go away!! Baby sunscreen? Where is the little man heading already? I love that you shredded the apples in this. I have to try it! So we grabbed the baby sunscreen because they often take the kids out to play outside during daycare. They’ve kept the little ones (his class) indoors until now, but with the weather getting nicer (sorta) we figured we should be prepared. I was actually just thinking about you the other day, Z! I saw some photos of your little man on Facebook…what a charmer! The ladies better watch out. 🙂 Hope you guys are doing well. Hang in there…I swear warmer weather is coming. Right? We rarely get any snow in London – but we do get plenty of rain 😉 Can’t wait for warmer days. Your quiche looks delicious, I very much like the combination of apples and sausages. Count yourself lucky about the lack of snow over there, Miriam! I used to live in the southern part of the U.S., and I always dreamed of snow. Now I’m way over it! Thank you so much for stopping by and commenting…nice to ‘meet’ ya! And p.s. I love London. My wife and I have been talking about taking a trip over there, and we’re trying to debate whether it’s worth doing since we have a 4-month old son now. Either way, London is on the list!